During this year's MWC in Barcelona, Asus unveiled its flagship phone, the ZenFone 5z but it's yet to release it on the market. 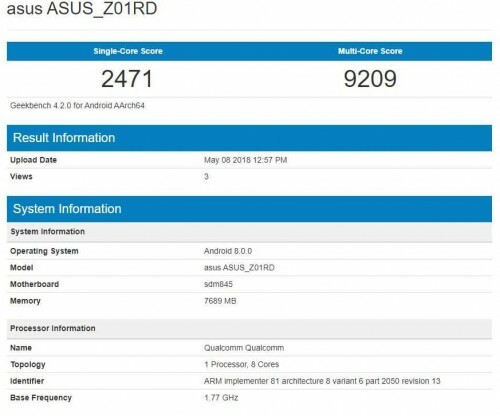 The wait might be coming to an end though, if the leaked Geekbench score is to be believed, ZenFone 5z's launch is nearing. However, according to the score sheet, the handset has a model number of Z01RD and not ZS620KL number, which is believed to be the correct one of the ZenFone 5z. It could be an alternative designation for a different market or a new device altogether. In any case, the mysterious ZenFone comes with Qualcomm's latest Snapdragon 845 chip and slightly outperforms the OnePlus 6. We hope an upcoming Asus announcement will clear the confusion.